‘Tis the season for parent-teacher conferences and if you have a visual learner, you may be filled with a bit of trepidation. For my own kids, these were always very positive, but school has changed a lot in 20 years and there are other factors that can make fitting in challenging. You need to approach parent-teacher conferences with a positive mindset. They’re such a valuable time to get to know what’s happening in the classroom and how your child’s doing. It’s early in the school year and the more you understand now, and the more you can help the teacher understand about your child, the more time you both have to set things in place to make the most of the months ahead. Visual kids are intelligent and creative, but often disorganized and distracted, which can make for some hard times in the classroom. Whatever you’re anticipating good or bad, schedule a time to go visit with teacher. Go! : Surprisingly, not everyone takes advantage of this opportunity to talk to their child’s teacher one on one. If you’re feeling good about your child and their class work, you’ll go and enjoy the positive reinforcement, as you hear what’s ahead for the school year. If you’re nervous, you may be tempted to pass, but don’t. Teachers respect parents that want to meet. And remember – you’re on the same team. So schedule your time and go! Respect the Teacher: It’s a tremendous amount of work for teachers to prepare information and thoughtful observations on so many students. They have a lot to get through in a limited time, so let the teacher share what they’ve prepared, ask questions, and try to get a sense of what’s happening in the classroom overall. Help the teacher know more about your child by sharing relevant information. But remember, there are lots of parents and only one teacher, so if you’d like or need to talk further, schedule a second meeting. Be Open: This teacher has only known your child for nine weeks, but they’ve been with them for nine weeks, all day, every day in a setting that’s very different than home. Be open to hearing what they’ve observed, what’s happening in the classroom and how your child is doing in that setting. On the other hand, while the teacher may have a wealth of experience with children in the classroom, she doesn’t know your child like you do. Nobody does. Share your thoughts on who they are and how they learn best. Help the teacher get to know your child so you can work together to get your child the education that works best for them. Take Suggestions: It may be only nine weeks into the school year, but the teacher may have some things for you to consider. Be open. You may not agree with everything said, but listen and see how they measure up to what you know about your child. My daughter got her eyes checked and did in fact need glasses, after the teacher suggested it in our first conference. Whether it’s about getting eyes checked, getting enough sleep, or problems paying attention and completing assignments, consider thoughtfully what’s being shared. Talk it over and decide what things to follow up on. 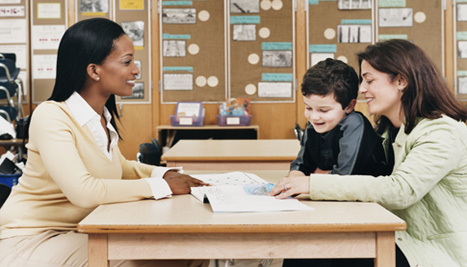 Follow Up: School districts set aside time for Parent/Teacher conferences once or twice a year. But don’t feel it’s the only time to talk. Set up additional meeting times, throughout the school year as needed. Take the initiative. Don’t wait to be contacted, especially if there are any areas of concern. This is especially important with visual learners that may be struggling in a specific subject. Stay connected while you are working on solutions. Take a Friend: Parents get nervous too. If you’re nervous or had a bad school experience yourself, conferences can be really intimidating. You may want to avoid the whole thing or if you do go, can get defensive, even adversarial. Take the sting out of things and take grandma, grandpa, sister or friend. Go in cool, calm and collected. Whoever you take, be sure they know your child, understand school and will be a calming support for you. The key to a successful conference is to remember that the parent-teacher relationship is a partnership. The teacher really wants your child to be successful just as you do. So schedule your time and go have a conversation with your child’s teacher. Video: How to Draw….a Mummy	eReader or Books: Where Should They Read?